Keep dry after each use. 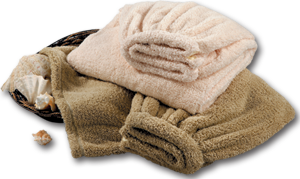 Care for your shower robe by drying them after each use. Wash your shower robe periodically with regular pH neutral detergents. This will help you preserve the life of your shower robe. Font pattern Microfibers are almost twice as fast and absorbent as cotton. 1/200th the diameter of a human hair, microfibers can absorb 8 times their own weight in water.